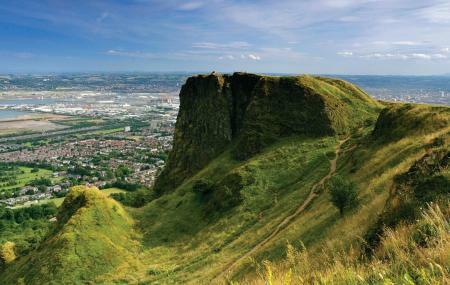 Enjoy panoramic views of Belfast by climbing up the beautiful cave hill. As a long lost custom, the locals visited the hill on Easter Mondays or Tuesdays and rolled Easter eggs down the hill to see which of them made it to the bottom. You could plan a picnic on the hill as well. The hill derived its name from the fact that is possesses caves on either sides along with historical and archeological features and natural wealth. You’d never get a view of the city like how you see it from the top of the hill anywhere else in Belfast. Wear comfortable shoes for the climb. Carry a bottle of water and a camera. Leave your cell phone at home so you can concentrate on the beauty of the hill and its surroundings. How popular is Cave Hill? People normally club together Belfast Zoo and Cathedral Quarter while planning their visit to Cave Hill. Great walk, great scenery and awesome when the sun is out. Highly recommend to get a view of Belfast city. Great place to walk any time of year. Views over Belfast make it worth the climb. Paths never to busy. Summit can get busy on a clear day. Beautiful Park and lots of easy to medium difficulty hiking paths!